This cycling tour around Europe has officially started! I am writing this from a town/city (?) called Sarpsborg, about 20 miles from Rygge Airport and 20 miles to the Swedish border. My alarms went off at 5.30am this morning but had little effect on me as I was already awake, thinking about the day ahead. I had got my bags ready last night so had a quick shower, making most of the hotel’s facilities, then hobbled over to the taxi taking me to the airport. This time a friendly driver! Checking in the bags and bike went without drama, apart from when the baggage man (I’m sure he has a better job name) had to push my bike bag with a long stick as it got stuck on the conveyer belt! I don’t normally go in for business class or priority boarding as I never see the point, but as it included a checked in bag, it worked out cheaper overall so I went for it. When I was halfway through the long queue for hand luggage and xray, I noticed that there was a much smaller queue down the left hand side. I was not best pleased when I realised it was for priority boarding tickets! Not the smartest move. However, after a quick breakfast smoothie I made full use of my priority ticket and went straight to the front of the queue to board the plane. First time that has happened at an airport! The flight itself was slightly delayed but caught up with a strong tailwind. 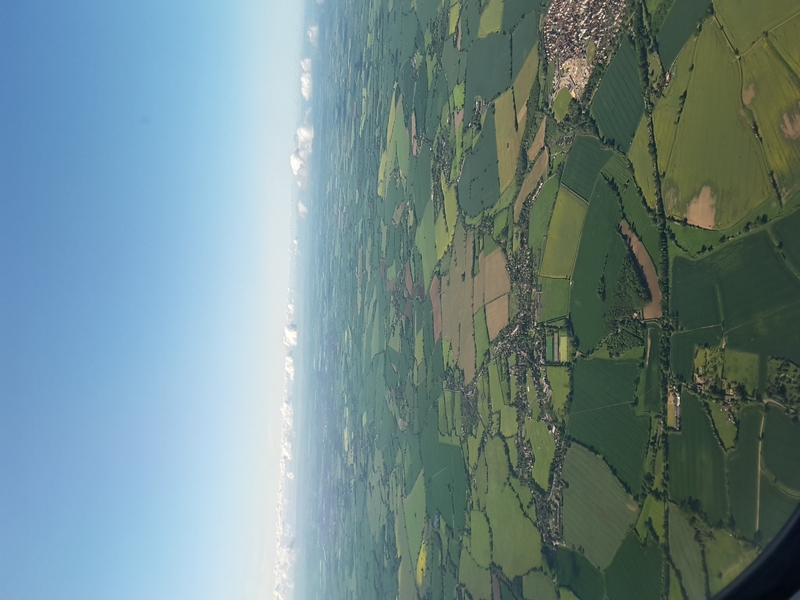 Although in Stanstead it was thick fog, once up in the sky it was beautifully clear. I never thought London looked so good! Once down in Rygge, with a quick passport check, nothing like the queues in Stanstead, I was glad to see my luggage again. 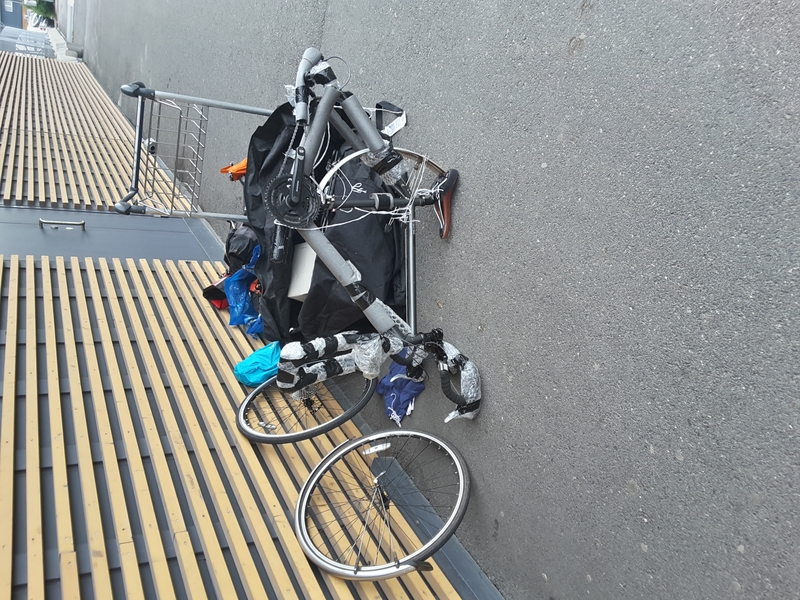 Everything was there, even though my two panniers that I had strapped together had come apart. Getting out of the airport was another matter. There were two small automatic doors. As they were small and my bike big, I thought it a good idea to do two separate trips. 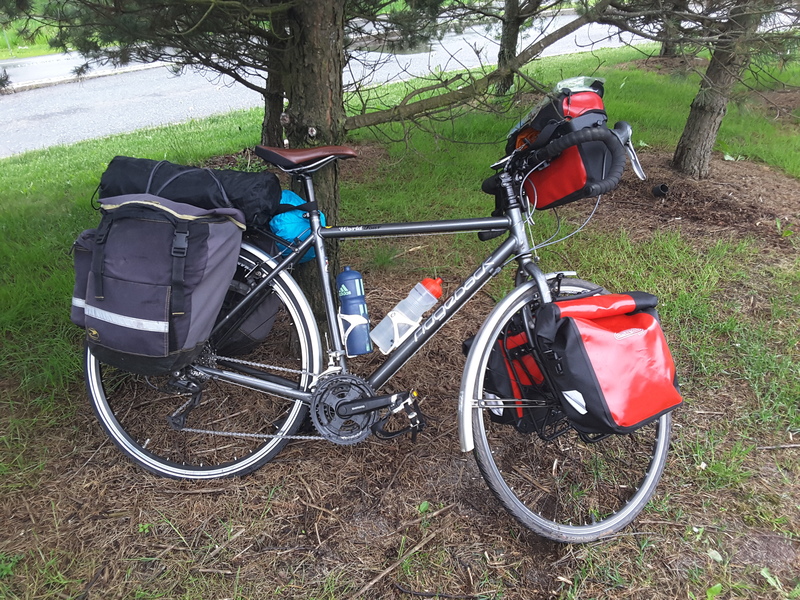 It was only after I had left my panniers on the inside that I realised I wasn’t able to go back through as they were only one way! I felt slightly stupid peering though the doors, seeing if anyone realised that there were two panniers left alone. Good thing there weren’t many security guards around! Finding an information desk was easy due to the airport size and they were soon able to reunite me with my belongings. Once out, I had the task of reassembling the bike back together, something I thought would be a quick job! Bubble wrap, cardboard, string, duck tape and more bubble wrap…the bike was covered in protective gear. After about an hour and a half it was up and ready to ride. Surveying the bike saw that there were only two problems, much less than I though flying with a bike would cause! The first was a missing bolt to attach the rear mudguard (my fault for not packing it). With a small amount of wire this was soon fixed. The other issue was the right side of the handlebar was bent inwards. Not a major problem but am still looking for a bike shop to bend it back, my strength isn’t enough! Cycling after a day of travelling and weeks of planning felt strange and very wobbly. I never ridden with five panniers before so it was a new experience! Cycling down Norway towards Sweden reminded me of Wales. Lots of green everywhere. However there was little in the ways of flowers or any other colour! It was a cool 10°C and spitting with rain, just like the Welsh weather too! 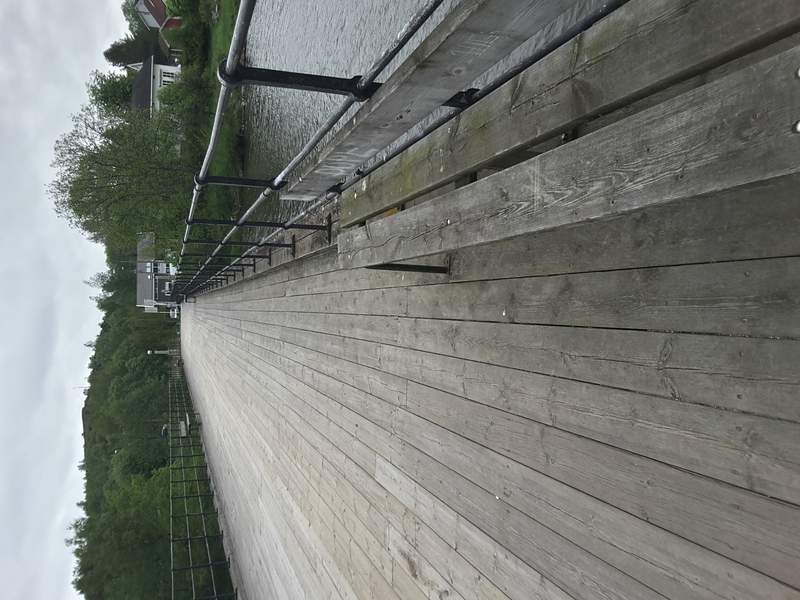 It turned out that from the airport practically to Sarpsborg there was a cycle path. Something I hadn’t seen on the map. All signed, tarmac and bridges. It was brilliant! The only downside was that it was very close to main roads and motorways. 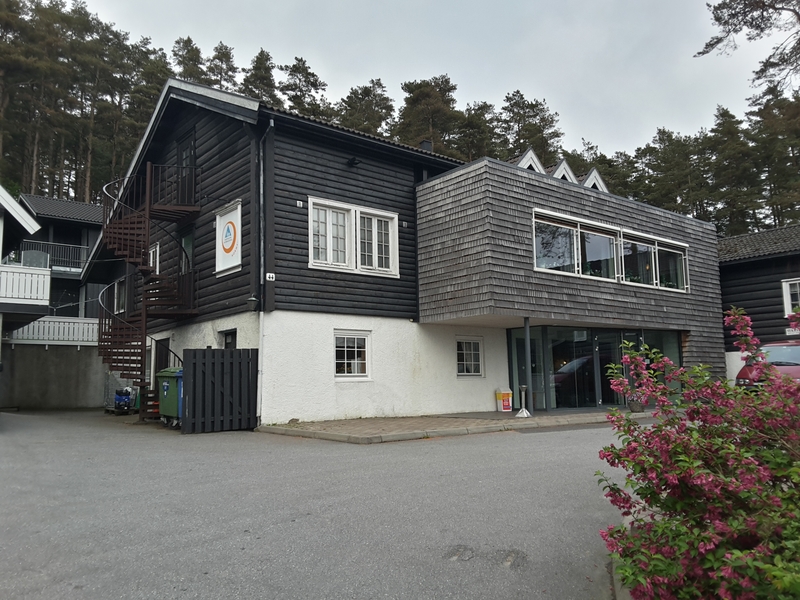 Having been a tiring day from traveling and an early start, I knew there was a youth hostel in Sarpsborg, so once in the city I booked myself in after 20 miles of cycling. Not much but it’s a start! Before I left the UK I bought myself a small but powerful camping stove thinking I could take it on the flight. However, after quiriering it with Ryanair, they told me otherwise. Fate was on my side though as just down from the hostel was a large shopping centre with a massive outdoors shop in – the biggest I’ve ever seen. The Norwegians must be keen on there outdoors! I bought lightweight gas stove with gas for 179 NOK. First I was shocked at the prices, but after checking with my currency converter I realised it was only £14. I thought Norway was supposed to be expensive!